Blissful comfort and delightful elegance. 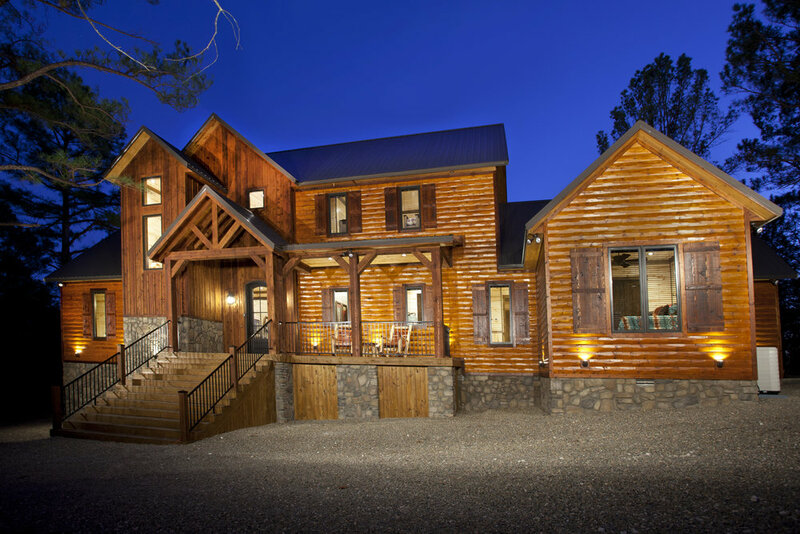 When you think of a log cabin, you may visualize a rustic design with ordinary furnishings. Well, there is nothing ordinary about "Call It a Day"! In addition to that wonderful rustic atmosphere created by this newly built cabin (spring of 2016), the guests of “Call It a Day” will experience blissful comfort and delightful elegance among its many outstanding amenities. This spacious, luxurious cabin features 3400 sq. ft. of living area with over 2,000 sq. ft. of covered decks. “Call It a Day’s” absolute rustic luxury inside and out will amaze your family and friends! Located on a spacious 1.4-acre lot in Lakewood Estates across from the Carson Creek entrance to Broken Bow Lake and Beavers Bend State Park, the cabin is centrally located to all the attractions in the Hochatown area. The main living room features soaring high ceilings, plush leather sofas, recliners and a remote -controlled, oversized gas log fireplace. Mounted on the beautifully rocked fireplace is a 75” Flat screen TV with an impressive surround sound audio system and Blue-Ray DVD player. The family room opens to a fabulous chef’s kitchen and spacious dining area. The grand dining table seats 8-9 people comfortably with an additional 3 people at the large granite island in the open kitchen. This chef’s kitchen features plenty of room for several cooks, lots of storage, top-notch cooking pots, pans, utensils and tableware. The chef in the family will marvel at this large gourmet kitchen and will have everything needed to create meals for a memorable family vacation. “Call It a Day” also provides plenty of room for quiet time and seclusion. Downstairs, the cabin features 2 master bedrooms with lavishly adorned king beds and full baths. The two bedrooms upstairs share a full-sized Jack-n-Jill bath. One upstairs bedroom features a queen- sized bed and a twin bed. The other upstairs bedroom features 2 bunk beds. Each bedroom is spacious with high-end bedding, top quality linens, and 40” televisions. The cabin sleeps 11 comfortably in beds. All of the rooms are very spacious with beautiful accent pieces and comfy linens which give a warm " home away from home" atmosphere. Entertainment is strongly emphasized at “Call It a Day”! Offering a second living area with a pool table, table games and a 60” Flat Screen TV, the cabin provides plenty of space for the “gamers” in the group to have their own area separate from the main living area. This second living area is furnished with a large leather reclining sofa and a luxurious leather rocking recliner. Just as amazing as the inside, the outside area of “Call It a Day” features an over-sized hot tub in a covered cabana, a large gorgeous cedar dining table, beautiful lighting, a high-end gas grill, a horseshoe pit, fire ring and a Lifetime Bar-B-Q Pit Smoker. Have an early morning cup of coffee in the authentic log rocking chairs on the front porch and/or enjoy time with friends and family along the back of the cabin which is completely under roof with multiple sitting area featuring beautiful, hand-crafted cedar log furniture. "Call it a Day" with its secluded, spacious 1.4-acre lot offers plenty of room outside for the family to play yard games as well as ample parking for boats and cars. When the sun sets, you can cook hot dogs and make s'mores by the camp fire under an amazing star-filled Oklahoma night sky. Spending time in the large covered hot tub cabana is another wonderfully relaxing way to end an activity-filled day at one of the most beautiful lakes around. Come and join us in the piney woods of Southeast Oklahoma and relax at " Call It a Day". We promise your stay will be amazingly memorable!